Crazy cat lady is the term that coined to depict a lazy woman who owns a lot of cats. 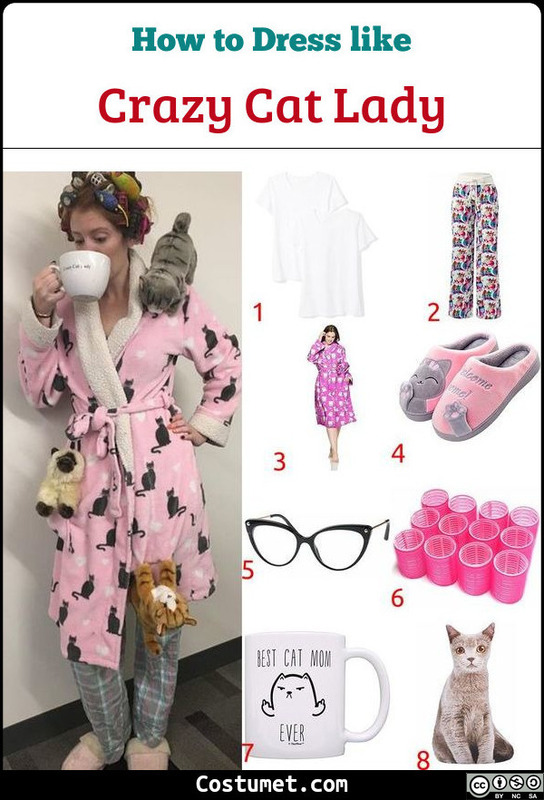 With that said, we will have our cat lady wearing a white oversize T-shirt, pajama pants with cat prints, a bathrobe, indoor shoes, and big glasses. Her props will include old-fashioned hair rollers, a coffee mug, and cat dolls. Doesn't it sound fun and cool? See down below for the items you need to make create this look! 1 White T-shirt Get a plain white T-shirt to wear. Make sure to get an over size one to create a worn out effect. 2 Cat Printed Pajama Pants Wear a pair of pajama pants with cat prints on it to show your love for the cats. 3 Pink Bathrobe Top everything with a pink bathrobe (or any other colors you prefer). 4 Indoor Slippers Get indoor shoes to wear. Preferably with a cat design. 5 Transparent Lens Glasses Look for transparent lens glasses with a black frame. 6 Hair Rollers Put a bunch of hair rollers in your hair. 7 Coffee Mug Get a big coffee mug with a cat on it. 8 Cat Dolls You can't be a cat lady without cats! Get 4-5 medium sized cat dolls and pin them onto your bathrobe with safety pins. Have you ever seen something so relatable it is funny? The crazy cat lady trend is one of those things. At first, it seems that we're making fun of old unmarried woman whose apartment is filled with cats and stinky smell. But we're actually not. People nowadays don't laugh at this because it's difference, but actually they laugh WITH it because it's too close to home. With that said, the definition of cat ladies is also changed a bit too. These women don't need to be old and bitter anymore, but they could be young women who are just too lazy to find a boyfriend and prefer to have a good time with all the cute cats. Town people call her crazy but she is so much more.